Israeli woman and her three children brought home after being stuck with abusive Palestinian for 15 years. The Yad L'Achim anti-missionary organization safely extricated a Jewish mother and three children from an Arab village last week, after a 15-year ordeal. The woman, referred to as 'A.,' married a Palestinian Arab working illegally in Israel in 2001. 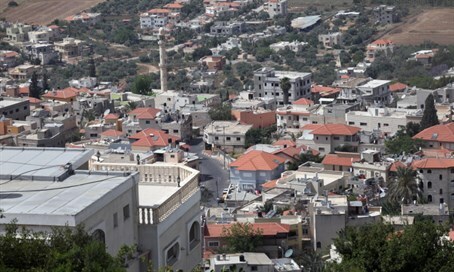 They lived both in Israel and in a Palestinian Authority (PA) village. After he was arrested by police for crossing into Israel unlawfully, they were deported to the PA village and lived with his family. Eventually, they returned to Israel. Their first son was born in 2006. The Arab man promised A. many things before their wedding but reneged on them, the organization noted. He was often not at home for several months, while she was trapped in her home and unable to work. When he was home, he was violent. A. was stopped at a Samaria (Shomron) checkpoint several months ago, where an IDF soldier noticed her Israeli name. A. broke down and admitted she wanted to leave, but could not, and asked the soldier to help her. The soldier put her in touch with Yad L'Achim, which began to arrange for her rescue. A. revealed in secret talks with Yad L'Achim social workers that her husband and his family abused her, especially for being Jewish, and that she had been living in wretched living conditions - often among scorpions and snakes. She was also beginning to fear that her Jewish identity would become known, placing her life in danger further. Yad L'Achim rescuers extracted her and her children from the PA and brought her to a safe house in Israel last week; they also helped her file a police report over the spousal abuse. Shortly afterwards, her husband approached the police to inquire about his missing family, and was taken in for questioning immediately over the abuse; he was arrested and his detention will likely be extended as the investigation continues.